Along the Tablelands Trail in Gros Morne National Park in Newfoundland Labrador you can look up and see where someone has created an Inukshuk. 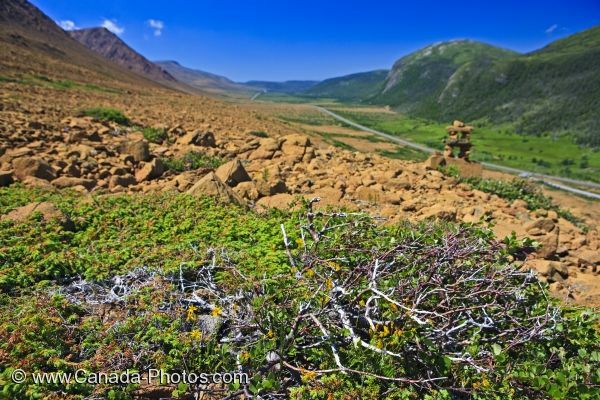 An inukshuk overlooking Highway 431 along the Trail in Tablelands showing a contrast between the two sides of the road from rocky to lush and green in Gros Morne National Park in Western Newfoundland. An Inukshuk was once used as a directional marker to help early settlers find their way and you can still see them along rock ledges or banks when traveling throughout Newfoundland Labrador. Inukshuk in Gros Morne National Park, UNESCO World Heritage Site, Viking Trail, Trails to the Vikings, Northern Peninsula, Great Northern Peninsula, Newfoundland Labrador, Newfoundland, Canada. Picture of an inukshuk along the Tablelands Trail in Gros Morne National Park in Newfoundland Labrador.